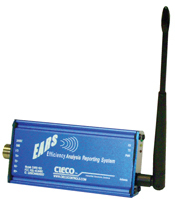 EARS (Efficiency Analysis Reporting System), a wireless or Ethernet machine-monitoring package, with basic software to monitor and log machine production. View real-time data in a spreadsheet on your PC for as many as 75 machines. Data is saved for use in custom reports in Excel, Access or Crystal—reports such as parts per minute, parts per machine, parts per shift, and uptime and downtime.